I've been playing with the ATUM system and I'm impressed by it's BOM capabilities, although at the moment I don't quite seem to be able to get the exact functionality I require from it. The site I am building is to take orders for custom made skydiving jumpsuits. These are made up of approximately 15 panels, each of which can be a different material type and different colour selected by the customer, which each then need to be removed from stock when the suit is ordered. I have set up the materials as variable raw materials, and tried setting up the jumpsuit product using the materials directly or using variable product parts for each panel which were then part of the suit. The problem I have seems in essence to be that the Bill of Materials is specified for each variation rather than each attribute. With the number of colours available in different materials we stock and the number of panels, this gives over a Quintillion possible variations, which is naturally quite impossible to add. I tried setting up variations only specifying one panel in each variation, however it appears the system picked the first variation that matched and therefore only adjusted stock for a single panel. Is it possible to have the stock adjustment done for each matching variation? 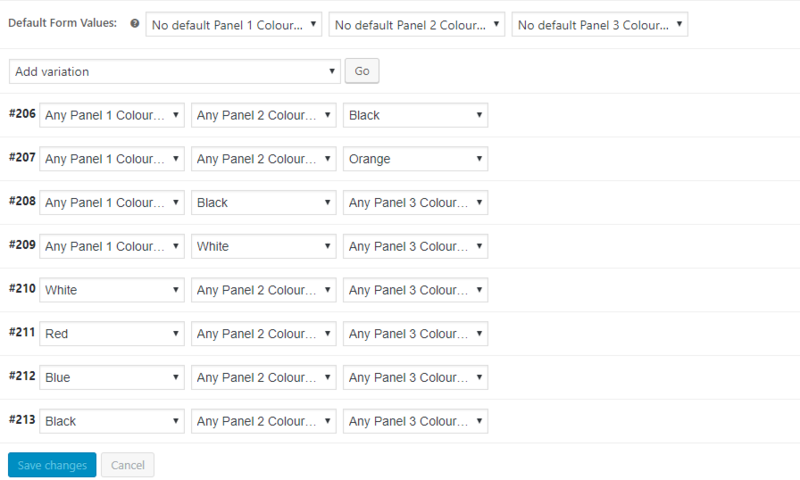 For example based on the image above, an order for a suit when panel 1 and panel 2 are black, and panel 3 is orange, should remove stock from the BOM of variation #213, #208, and #207. I'd appreciate any advice on whether this is possible with ATUM. I have discussed this with my dev and from the screenshot, we are not sure how you are building these combinations? Are you using some 3rd party plugin?